Though not being communicated, the accelerating data looks like the state of the climate is set up for feedback runaway global climate change. ​​Runaway climate change is not a scientific recognized term, but it is by far the greatest danger of global warming. A runaway state is the result of greater climate change (locked in) commitment, plus many amplifying feedbacks that are caused (triggered) by global warming. If planetary feedback emissions are increasing to the extent of driving the increasing atmospheric GHG levels faster, for policy making we should consider that a state of committed climate change runaway exists (or at least an extreme zero tolerance risk exists). A sudden jump or accelerating global temperature increase at the same time makes the situation more definite. The situation in which 'runaway' generally used in the science is the runaway greenhouse effect which results in a dead planet and applies to Venus. 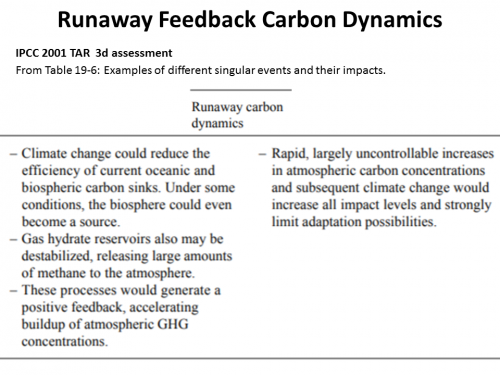 The situation of 'runaway' climate change in the science is ​'runaway carbon dynamics' and this is only ​to be found in the IPCC 2001 3rd assessment under 'large scale singularities' (above). It is not included in the 2014 IPCC 5th assessment. 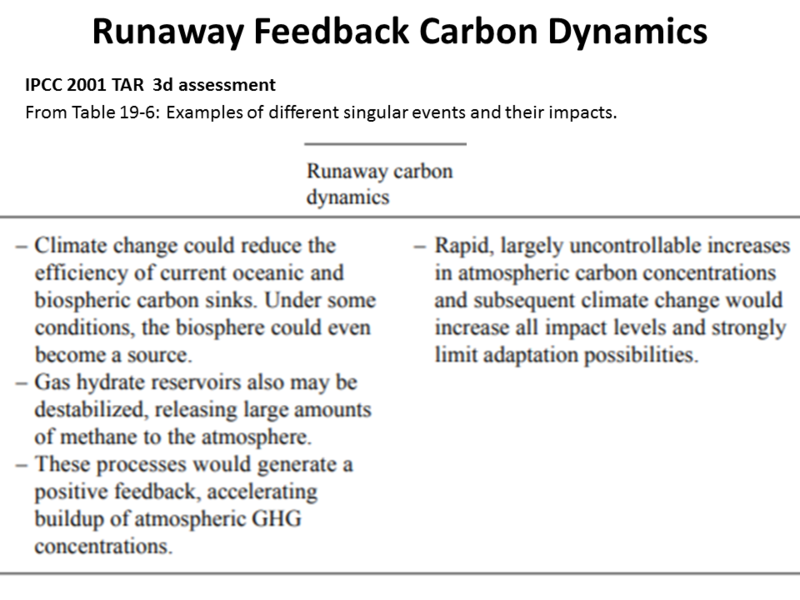 Runaway carbon dynamics means amplifying carbon feedbacks of CO2 and methane from the heated up planet, or weakening of the land or ocean carbon sinks. However feedback emissions of nitrous oxide are also caused by global warming, so the more complete term would be runaway GHG dynamics. 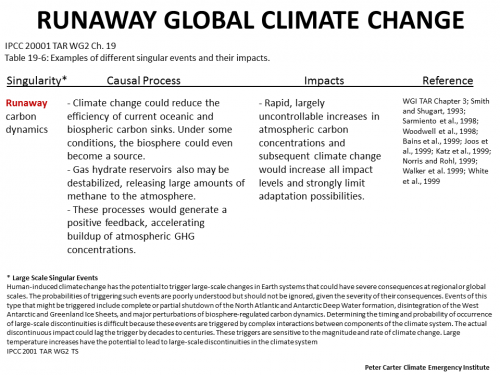 An Oct 2005 presentation (at Yale) by the IPCC Chair R Pachauri included 'runaway​ carbon dynamics' in a list of singular events. 'Runaway' (self accelerating) global heating and climate change is the planetary tipping point of many tipping points combined and in the case of the many Arctic amplification tipping points are self and inter reinforcing​​. Ultimate vicious cycles. This is the greatest single danger from global warming to the survival of humanity and also the survival of potentially almost all life on the planet. With all climate and ocean indicators accelerating (2016) humanity and life are in extreme peril from runaway. ​​​​A global heating feedback event wiping almost most life we know is possible- because it happened 250 million years ago in the End Permian extinction event and 55 million years ago with the Paleocene-Eocene thermal maximum (PETM). Current research confirms both of these extinction events were driven by very large emissions of carbon to the atmosphere. ​​The PETM is the closest distant past analog to our GHG emissions global warming situation today. Research published October 2013 by Morgan Schaller and James Wright leads to their definite finding that following a doubling in carbon dioxide levels, the surface of the ocean turned acidic over a period of weeks or months and global temperatures rose by 5 degrees centigrade – all in the space of about 13 years. Scientists had previously thought this process happened over 10,000 years. These mass extinction events involve the emission of an enormous emission of carbon as CO2 and methane. 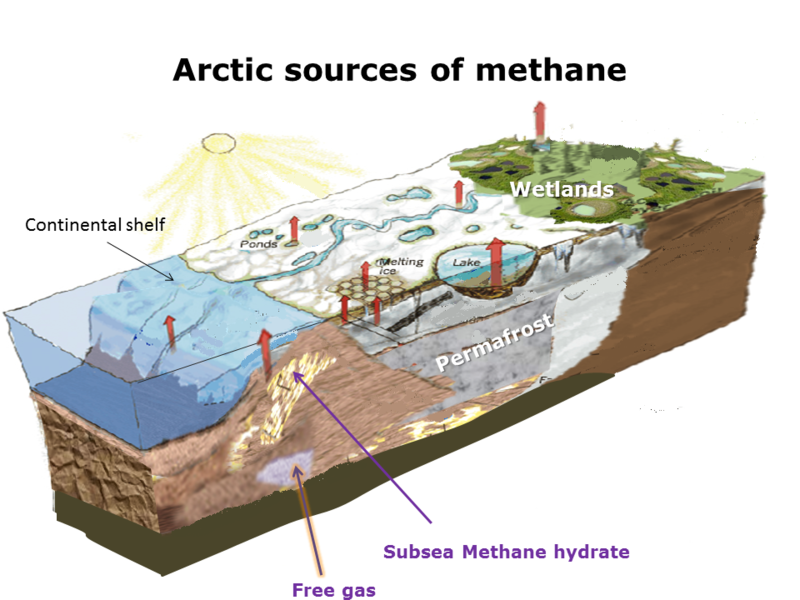 In the Arctic several times atmospheric methane is stored frozen in permafrost and subsea floor frozen solid methane gas hydrate. The permafrost is thawing as the Arctic temperature rapidly increases (Arctic amplification). 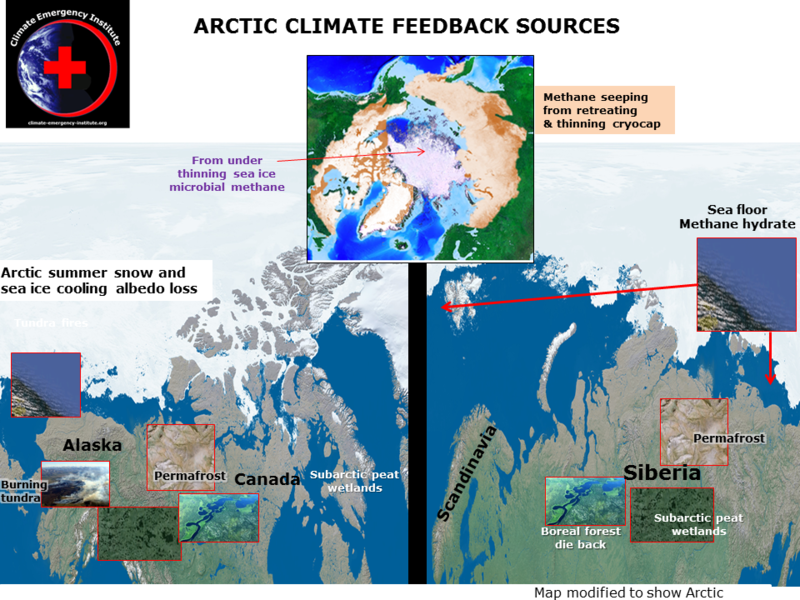 Arctic methane hydrate is destabilizing in at least three locations, mainly a process that has been going on for a long time, but that ocean warming will make worse. Right now we are in a very high risk of committed runaway situation, meaning we are committing ourselves and all life to a rapid accelerating global heating that we could not possibly change. James Hansen has been warming about this for many years. 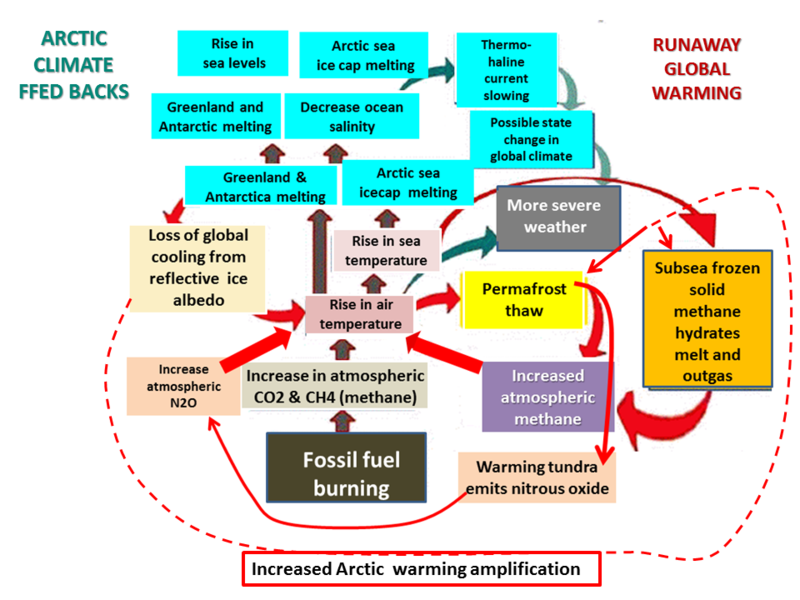 Runaway includes methane feedback emissions- especially the enormous stores of Arctic carbon as methane emitters. Carbon dioxide and nitrous oxide feedback GHG sources are also huge. In runaway all three would be self reinforcing and accelerating. This use of the world runaway is not a scientific term but the basis in science is definite. ​​This 'runaway' means the situation caused by positive (bad) feedbacks in which global warming accelerates the rate of global warming totally beyond any capacity of human control. ​​When describing this situation the scientists may use the terms of rapid global warming and abrupt global climate change. ​​Tipping points, irreversible impacts, and singularities are also scientific terms that apply​​. James Hansen says Runaway greenhouse effect" has several meanings ranging from, at the low end, global warming sufficient to induce out-of-control amplifying feedbacks such as ice sheet disintegration and melting of methane hydrates, to, at the high end, a Venus-like hothouse with crustal carbon baked into the atmosphere and surface temperature of several hundred degrees. Between these extremes is the "moist greenhouse", which occurs if the climate forcing is large enough to make H2O a major atmospheric constituent (Kasting, 1988). In principle, an extreme moist greenhouse might cause an instability with water vapor preventing radiation to space of all absorbed solar energy, resulting in very high surface temperature and evaporation of the ocean (Ingersoll, 1969). Our simulations indicate that no plausible human-made greenhouse gas forcing can cause an instability and runaway greenhouse effect as defined by Ingersoll (1969), Sept 2001​​ Climate Sensitivity, Sea Level, and Atmospheric CO2. Self-reinforcing feedbacks could push the Earth System toward a planetary threshold that, if crossed, could prevent stabilization of the climate at intermediate temperature rises and cause continued warming on a “Hothouse Earth” pathway even as human emissions are reduced. This paper warns that 'warming could activate important tipping elements (12, 17), raising the temperature further to activate other tipping elements in a domino-like cascade that could take the Earth System to even higher temperatures (Tipping Cascades)'. Even if the Paris Accord target of a 1.5 °C to 2.0 °C rise in temperature is met, we cannot exclude the risk that a cascade of feedbacks could push the Earth System irreversibly onto a “Hothouse Earth” pathway.' As we are committed to 2C without immediate rapid global emissions decline we are now at a point of runaway extreme risk. This NOT the 'runaway greenhouse effect" dead planet like Venus. 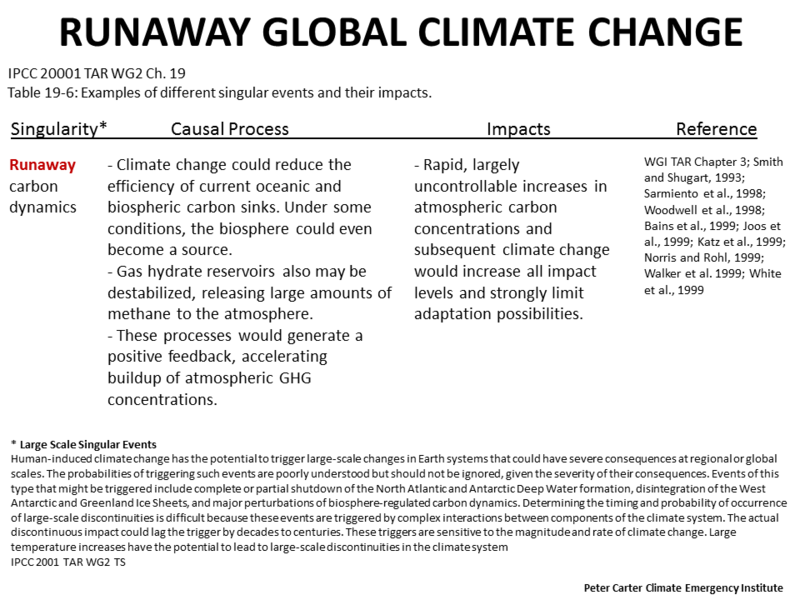 Runaway is worst End the world climate change scenario, and not a popular thing to investigate. It based on high degrees of committed future warming, that have the future potential to cause increasing emissions from large (previously) quiescent pools of carbon. 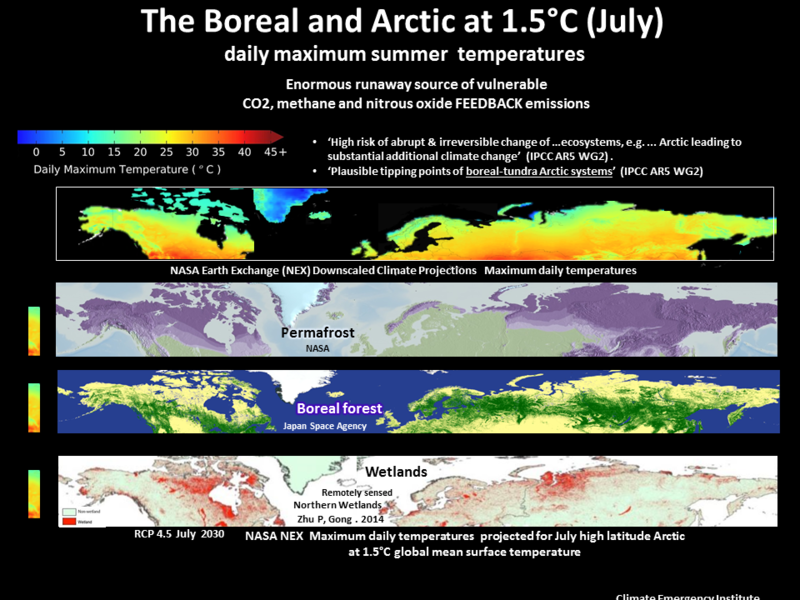 It is GHGas runaway- multiple self and inter-reinforcing GHG emissions that have been safely balanced (carbon cycle) cold (subarctic wetlands) or frozen solid(Arctic frozen soil permafrost). 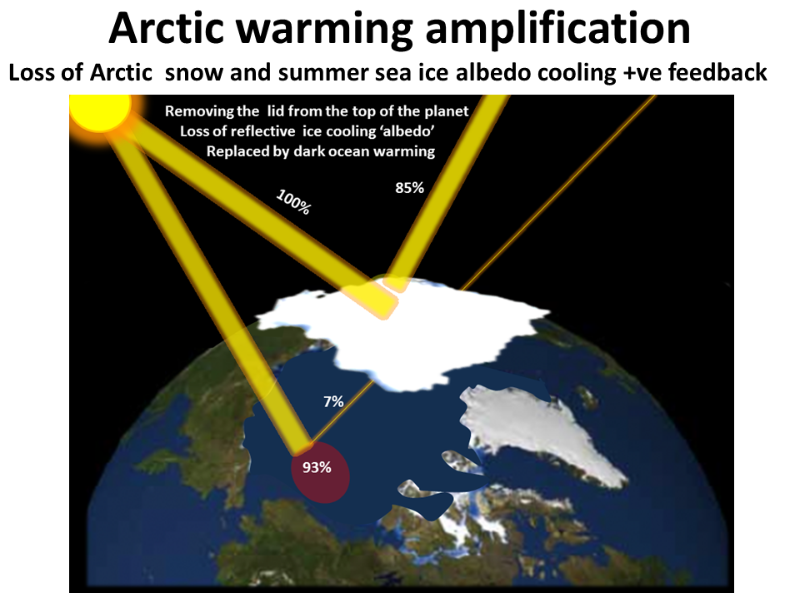 Arctic warming from global warming is self amplifying due to melting summer sea ice losing ice 'albedo' cooling effect.